This article follows our introduction to the Wars of the Roses available here. What is the best way for a King to secure his throne? What is the best way for a King to plunge his kingdom into years of brutal civil war? One such King was Edward III, who had no less than eleven legitimate children. Five males grew to adulthood, leaving Edward with what he thought would be a strong reigning family. Instead, he got a long-line of feuding male descendants who all believed they belonged on the throne. 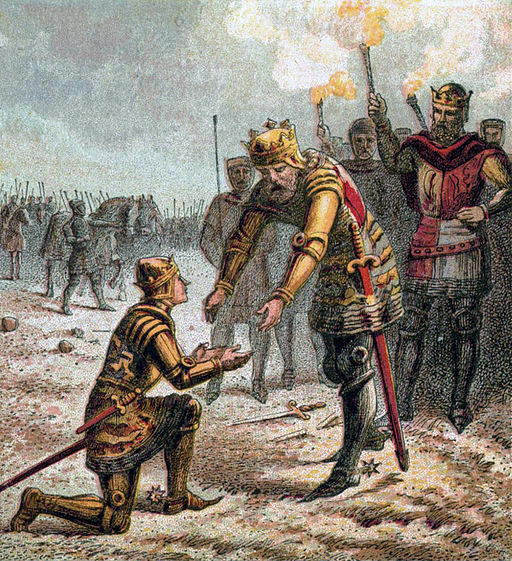 Edward III proudly receives his son, Edward the Black Prince, after success in the 1346 battle of Crécy. Edward the Black Prince did not survive his father though. Source: public domain image. Edward’s eldest son and heir died before he did, leaving a child as the new heir. Edward himself died when this new heir, Richard, was only ten years old. This left England in the dangerous position of being under the rule of a King who hadn’t reached puberty yet. Richard’s uncles, especially John of Gaunt, ruled the country until Richard was old enough and wise enough to exile the men trying to rule through him. John of Gaunt’s son then led an army against Richard, kicked him off the throne, and ruled as Henry IV. Which just goes to show, when it comes to the throne of England, family loyalty does not exist. This incident was also the starting point of a strong belief that would continue for centuries – ‘if there is a weak King and you have some sort of claim to the throne, you are permitted to fight for that throne.’ It was a belief that would savage England, kill many innocent people and make anyone with royal blood a would-be murderer. England at this time was involved in a very expensive war with France - The Hundred Years War. For five generations English soldiers were shipped over to France where they were trained to be as brutal and blood-thirsty as possible. When the war ended with France winning and re-claiming all of her territory, 116 years of violence and war-lust was returned and set loose upon England. Suddenly fifth generation soldiers with advanced degrees in torture were expected to be farmers, tailors, blacksmiths… peaceful people. Under the rules of Henry IV and Henry V, England had been full of happy warriors fighting for land, fighting to make England rich. It was, to them, almost like the golden days of Arthur and Camelot. Unfortunately, the loss of French territory, coupled with the crippling of the Royal treasury, meant Camelot was quickly replaced by a broken country. The feeble-minded Henry VI only added fuel to the fires of unrest that burned across the land. When the black plague struck in 1348, the majority of the labor force was wiped out. This caused severe inflation of labor and products which did little to quell the unrest. The lack of man-power meant a shift in England’s ruling class. Small landowners could now buy up more land from the dead, creating more wealth for themselves. For the first time, the land owners were now richer than the King. This put the Royal Family in a precarious position as the land owner could call on their tenants to take up arms and fight at any time. A smart King would then need friends in the right places; alas, Henry VI was not a smart King. He kept company with very unpopular Dukes who were descendants of Edward III, as well as cousins of the King and his enemies. When madness struck the King – possibly caused by the loss of French territory - the unpopular Dukes were happy to step in and rule through him. A shaky peace existed between 1450 and 1453 as the mad King had no heir and was expected to die soon. The next in line for the throne would be a cousin of Henry VI, the popular and respected Richard Plantagenet, the Duke of York. Richard had an unbroken male line all the way to Edward III. England was just playing a waiting game. The birth of Henry VI’s heir in 1453 complicated matters. If the mad King were to die, he would leave a baby on the throne and the unpopular Dukes would surely rule through him. And so, the Duke of York and his followers took matters into their own hands. Remember those fifth generation soldiers schooled in brutality that came home to England with nothing to do? The House of York found a new job for those soldiers. And so began the Wars of the Roses, also known as ‘The Cousin’s War’. On May 22, 1455, the battle of St. Albans kicked off thirty years of war between the male descendants of Edward III. By M.L King, a history enthusiast and part-time blogger. The next article in The Wars of the Roses series is about the death of gentlemanly war and the battles from 1455-1464 - available here. Join the debate and hear about the next in the series! JOIN US and we’ll keep you updated! Click here.